I have a shared macro file list that 4 of my macs access at all times. I use 99.9% of the same macros on all 4 macs, BUT one mac has a 30"4k second monitor for which I made a HOME APPs macro to open all my essential apps and position/size the app windows. How do I wirte the macro to only activates on MacBook Pro 1 and NOT have it activate on MacBook Pro 2-4? My first thought was to DEACTIVATE just that macro on MacBook Pros 2-4, but I guess since the MACRO LIST is shared, if I deactivate that one HOME APP macro on say MacBook Pro 2, KBM automatically deactivates the macro on all Macs sharin the macro file list. Can I somehow rewrite the macro to trigger by certain COMPUTER NAMES and not others, orwrite the macro so it only activates when the static IP address of MacBook Pro 1 activates (all 4 macs used a different static IP address)? Just seem there has to be a simple answer. How do I wirte the macro to only activates on MacBook Pro 1 and NOT have it activate on MacBook Pro 2-4? 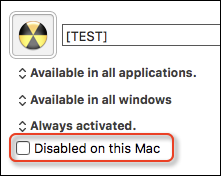 These is a setting in the Macro Group that allows you to "Disabled on this Mac". It does not let you specify a Mac by some ID, so AFAIK you will have to check this box while on each Mac in which you do NOT want to use it. Obviously, you will need to put all Macros limited to the one Mac in a specific Macro Group by themselves. It would be very useful to have this be a popup that also provides for "Enabled Only on this Mac", and/or allow for entry of the Mac ID of the Mac(s) to be included/excluded.